This plan covers part of West Norfolk, with Lynn Regis depicted at the top left on the west bank of the River Ouse. Derived from the Gaelic for 'lake' or 'pool', the town was originally called Lin, changing to Bishop's Lynn in 1204. After Henry VIII's dissolution of the monasteries in 1536, it became Lynn Regis, and finally King's Lynn. 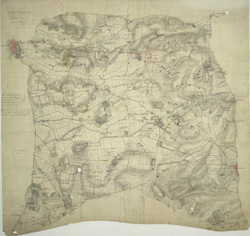 The heaths and commons characteristic of the area are represented by open dotting, particularly evident in the right-hand portion of the drawing. Warrens are depicted by dense colour washes and short disconnected lines - a technique known as 'hachuring'. Along the left margin of the sheet are numerous annotations, with corrections marked in yellow on the plan.